The Great King again offers you the best and healthiest product that the sea has to offer. 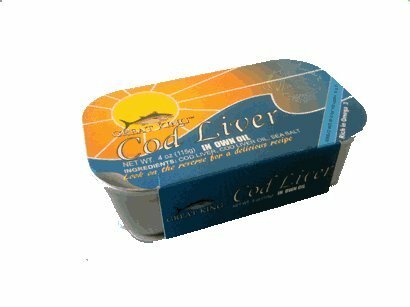 Cod Liver and cod liver oil are nutrient-packed super-food supplements that can help boost energy, libido, muscle growth, brain power, and general health. They are abundant sources of nutrients difficult to obtain elsewhere, such as vitamin A, arachidonic acid, DHA, and the B vitamins. This unique cod liver is wild caught in the icy clear waters of iceland, and packed the same day. People in iceland eat cod liver for centuries, from toddler to weight lifter to old age for all the benefits has to offer. This cod liver is packed fresh same day fish is caught. If you have any questions about this product by Great King, contact us by completing and submitting the form below. If you are looking for a specif part number, please include it with your message. Redhook ESB Ale Batter Tilapia Fillet, 4 to 5 Ounce of 34-64 Pieces, 10 Pound - 1 each.